If you missed out on Michael Moorcock the first time around, the collated paperback editions of his work from Gollancz are an excellent way to discover his stories. Kane of Old Mars collects three Kane books, Warriors of Mars, Blades of Mars and Barbarians of Mars. All of Moorcock’s adventures are ultimately connected through the premise of the Eternal Champion. Readers of the collated Nomad of Time trilogy, which follows the adventures of Oswald Bastable will quickly recognise the interviewer and first person narration style of this book. We are introduced to Michael Kane (obviously, no relation) through the eyes of a biographer called E.P.B (Edward Powys Bradbury). Once the two strike up a rapport, Kane regales his companion with the story of his adventures, beginning with how he found himself transports from Earth to a Mars far different to the one we know. Warriors of Mars takes our hero from Earth to this new land and swiftly embroils him in an epic struggle between kingdoms as he seeks to defend Karnala, ruled by the Bradhinaka, Shizala, who Michael Kane quickly (perhaps too quickly) falls in love with. The resulting quest narrative is used to explore some of the unfamiliar locations of this strange world. Blades of Mars sees Kane return, but to a different region of Old Mars, and learn more of its history and the current politics of the new region as our hero embroils himself in the conflicts of its kingdoms, aiding an exiled noble in his struggles to retake the throne of the Mendishar. Kane is unsure whether he has arrived in the past or the future of his previous visit, but his explorations of the strange world establish a larger canvas for Moorcock to explore. The adventure turns from a quest into a voyage and then picks up the story of the previous book. Barbarians of Mars tells the story of Kane’s wandering adventure in an airship with his friend Hool Haji. We travel far from Karnala and encounter the strange city of Cend-Amrid and the Barbarians of the title. 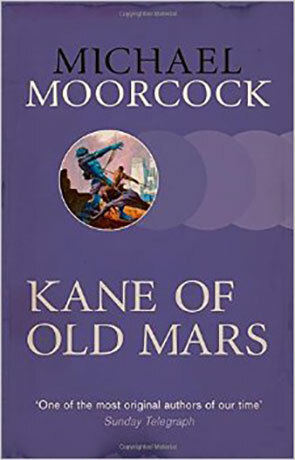 Moorcock clearly acknowledges these stories as being homage to Burroughs, Barsoom and John Carter. This is perhaps why the opening of this feels a little more contrived than Bastable’s adventure, perhaps because Kane’s assumptions about the people around him and his place within them feel convenient at times. The way he becomes part of the struggle of the Karnala against the Argzoon giants is not dwelt on, in a similar way to how modern fantasy blockbusters like Guardians of the Galaxy encourage you not to look left or right. Difficulties like language and operating technology are quickly contrived away, but then this isn’t where the audience wants to dwell. Michael Kane is a strange fossil. A character written in the sixties as a nod to a character first derived in 1911. In aiming for Burroughs’ pulp style, Moorcock is painting at speed and saving his words for epic action. Kane’s adventures are full of swash, suave and buckle; the sort that children and young adults might dwell on after putting the book down and closing their eyes for the night. These are a trilogy of Sword and Planet adventure stories first and foremost, with considerations of realism set aside. The first person narration helps with this, reminding us we’re getting one man’s take. Occasionally a bit of gender bias creeps in, whether from the writer’s period or the period he is emulating, but again, this can be attributed to the character in some places. The close viewpoint used to ensure we don’t dwell too much on some of the ‘hows’ and ‘whys’ that remain outside of Kane’s knowledge and control. As we move through the books, the character’s identity becomes more assured. If you haven’t read Michael Moorcock, Kane of Old Mars is a good entry into his work. Written on 16th April 2015 by Allen Stroud.